Doctors Shocked After Removing cyst From A Teenage Girl's Stomach. A teenage girl has undergone life-saving surgery to remove a cyst from her ovary - which weighed as much as a five-year-old. 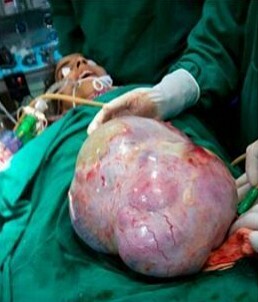 Khalida Akhter, 18, suffered from chronic stomach pain before the emergency procedure to remove the 21kg growth. Doctors initially believed she was suffering a gastric problem but had to act as the pain intensified over a six-month period. As the pain grew so did the size of her stomach, which left her looking pregnant as well as keeping her bed bound. The student was forced to drop out of school due to the pain and swelling. As Khalida, from Kashmir, India, became more secluded, rumours of her health began to circulate around her small village as locals began to believe she was pregnant or cursed. Fearing the worst, Khalida's parents travelled with their daughter to the nearest hospital in the area and begged medical staff to help them. On her arrival at the hospital, doctors were shocked to see the size of her stomach and rushed the student to the theatre for an emergency operation. The doctors discovered a cyst which grew to be 21kg in weight and may have done more damage to her health had she not undergone emergency surgery. Ovarian cysts are common and for the most part quite harmless. The cysts consist of fluid and usually grow to be just a few centimetres in size until they pop on their own. The team at Mirza Mohd Afzal Beigh Memorial Hospital were amazed that Khalida had coped with the cyst for so long, and believe it is the largest one ever removed from a patient.